“I was surprised to get your call this morning. Are you sure you don’t need more time? It’s only been two weeks since you started on the job,” Mr. Mohanad Zahir asked me when I walked in. He was standing on the terrace, observing his gardeners at work. “No matter who the culprit may be?” I asked. I contemplated on his words for a silent moment. Being the sole heir to the Zahir’s fortune, I knew for a fact he’d inherited the whole empire from his late father. The man was obviously in utter denial. “You must have inherited this grit and fortitude from your father as well. I hear he was a legend.” I added carefully. “I know what people are saying behind my back,” Monahad continued. “But I’m proud of what I’ve accomplished and I’ve never allowed myself to live in my dad’s shadow.” Mohanad rested his elbow on knees, then rubbed his forehead while closing his eyes silently. “Sir?” Alfred came running like a headless chicken. “Advil,” Mohanad demanded rudely. And even though within a minute the painkiller was served to him on a gold plated tray next to a tall glass of water, Mohanad still snapped at the poor butler for taking forever and insulted him for his incompetence. Doesn’t take a genius to see this was conversion and displacement put together. “You seem very stressed Mr. Zahir,” I said. “I’m fine. I get this sharp pain in my shoulder and splitting headaches every now then.” He declared. “Since your car accident perhaps?” I asked. “What car accident?” Mohanad panicked. His face suddenly flushed blood red. “What are you getting at?” Mohanad breathed heavily. Mohanad stared back at me, his eyes wide with horror. “I guess you forgave them and moved passed it when you realized they were right all along. The accident was a result of your negligence and reckless driving.” I insisted. “I don’t know what to say, Mr. Zahir. This is rationalization and you know it” I shook my head disapprovingly. “So what’s gonna happen now?” Mohanad sighed. “Oh no, you DIDN’T” My assistant Jenna said with an exaggerated accent. “What else was I supposed to do? Like my friend Mr. Zahir says, ‘justice has to take its course’” I smiled. “With most insurance policies, even after the expenses have been paid, there’s usually a grace period where either party is allowed to reopen the claim after it’s been settled. I guess Mohanad tricked everyone by hiring me. Him being so adamant to find the thief is proof enough he didn’t do it, and it would definitely discourage the insurance company from reopening the case and wasting their time and money.” I said. “And he really convinced himself he wasn’t doing anything wrong!” Jenna screeched. “ORRRRR…. You can put this story to good use and write a thriller series about the different types of self-defense mechanisms.” Jenna winked. “If only you knew…” I laughed as I walked away. Any thoughts on why I always get the blues whenever I write the last paragraph of the final episode of any series? I’m gonna miss Amy! And I’m still worried about Hamza’s future and Sameera’s fixation on the past. And most of all, I’m REALLY gonna miss you guys. I guess I’m not ready to say goodbye yet, and the editors are just going to have to drag me out of here screaming and kicking LOL. All jokes aside, there’s actually still a lot more to say about ‘self-defense mechanisms’. Some of them are really productive too, like those who channel their anger into cleaning (yeah, my best friend does that, and needless to say her house is spotless). Some use humor to lessen the impact of tension or uncomfortable emotions, while others might go out for a run when they’re distressed or beat the hell out of a punching bag. Those are all considered more ‘mature’ types of defense mechanisms, and even though we know that, do most of us reject them in times of despair? Does it make us horrible people? I think our hearts aren’t designed to endure so many struggles. We’re already drained from those inner battles we fight silently. Every. Single. Day. We don’t need new contenders to add salt to the wounds, thank you very much. Because when you’re trapped inside a burning building, no one will blame if you yell or scream or use your boss’s new Armani coat to put out the fire. When you’re trapped inside your fear, insecurities, and anxieties, you’ll rationalize your behavior. You’ll give yourself excuses, or snap at someone else, especially if that person tries to expose your weakness at a time when you obviously need every ounce of strength you can muster to survive that invisible inner war no one knows about except you. But here’s the thing, now that you know what some destructive self-defense mechanisms look like, you’ll have a hard time rationalizing them. Whenever you act out, project, form an extreme reaction, dissociate, slide into denial or fly off to fantasy land, a little part of you will remember this series and a voice in your head will whisper ‘Who are you kidding?’. It will be difficult at first, especially when someone criticizes you, and you have to swallow your anger instead of yell back ‘why don’t you shut your pie hole and take a long hard look in the mirror first, HAAAAAA?!’. You’ll clench your jaws till your teeth shrink, or lie to yourself and pretend you’re not even hurt. It’ll be like getting hit so hard and yet doing nothing about it, which is, to use the clinical term, a very ‘stupid’ plan. No one is asking you to take more than you can bear because sooner or later, you’ll collapse to the ground. All I’m saying is don’t keep the pain inside, and don’t pass it on to someone else. Resolve it in a healthy manner. Respectfully stand up for yourself when you feel oppressed, identify your triggers and get down to the core of the problem, or just sit alone with your feelings until they pass through and release into tears. True, rubbing salt on the wound hurts incredibly, but do you know what else the salt does? It purifies it…. I’ve seen so many loved ones block out their pain, or stuff it deep in their hearts. It changed them. The little specks piled up into poisonous venom eating at their goodness, their kindness and their ability to love and forgive. And I just can’t watch you do that to yourself, too. I can’t watch you slap a band-aid on an infected wound and hope that everything will be okay. The mere fact you’re reading this tells me you have so much potential. And I hope…. Oh, I do hope, you’ll break free from the shackles of silent pain. I hope you’ll find it within your ego to stop defending and attacking so you can finally find peace…. I know you wouldn’t defend yourself unless you feel attacked. When we think our hearts will never heal. When we think there’s no room for us grow; there’s barely room for us to breathe. When we have no energy to hear ‘constructive’ criticism, not when some of us already feel flawed and inadequate all on our own. I know all that. And somehow, watching you read this, I feel like I know you too. We can’t believe this amazing series backed with wisdom has ended! It helped us delve deeper into ourselves, learn the secrets behind some of our most uncomfortable personality issues and showed us how to deal with them in a more positive way for our own well-being and overall productivity. 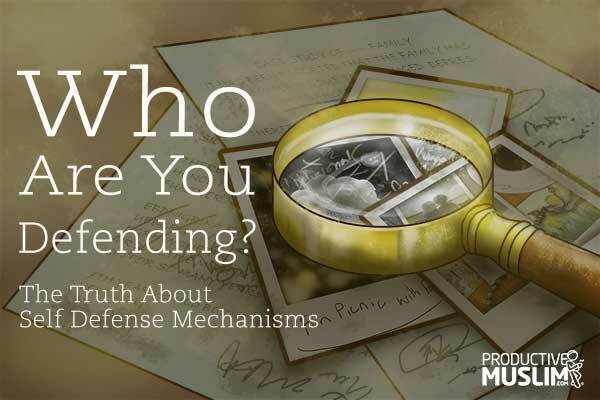 We want to take this opportunity and ask you, how did learning these defense mechanisms help you with your own self-discovery and attempt to develop yourselves? We look forward to reading your insights in the comment. If you’re interested in more faith-based personal-development gems, subscribe to our newsletter to get our manifesto, as well as, more exclusive productivity insights to help you with your self-development journey and success in this life and the next!